We are pleased to announce/inform you that High Island ISD has qualified under the CEP (Community Eligibilility Provision) to provide free breakfast and lunch for ALL High Island students for the next 4 years! High Island Elementary teachers are collecting Box Tops For Education. Please cut Box Tops from participating products and send to your child's teacher. Each Box Top is worth 10� for your school. 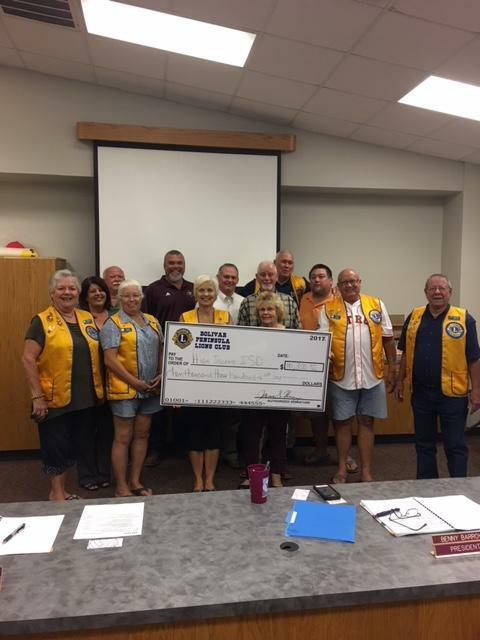 Bolivar Peninsula Lions Club presented High Island ISD with a check for $10,300 for student and staff supplies! Thank you for your support and all you do for our community! 2113 6th Street, High Island, Texas. The 2017 – 2018 School Calendar has been approved! High Island High School is participating in the Texas High School Coastal Monitoring Program on the Bolivar Peninsula. We are having a great time at High Island Schools! We accept transfers!! Please complete a transfer application and send to our principal's office.